HOLIDAYS are in order for Townsville’s stand-in leader for the past three years, Mount Isa parish priest Fr Mick Lowcock. In 2014, Fr Lowcock took up the challenge to lead Townsville when he was appointed diocesan administrator following the death of Bishop Michael Putney. His task of providing leadership when the diocese was without a bishop for more than three years, while still being available for his parish on weekends, gained him a standing ovation at Bishop Tim Harris’ episcopal ordination last week. During his first address as Bishop of Townsville, Bishop Harris ordered a holiday and rest for Fr Lowcock. “Mick you need a holiday and a rest,” Bishop Harris said. “I don’t mind when and where you go as long as I can ring you 24 hours a day, seven days a week if the need arises. Speaking to The Catholic Leader after the episcopal ordination, Fr Lowcock said he was proud of the Townsville diocese for organising the historic ordination. “(Bishop Harris) should think, coming into the diocese, that there’s a lot for him,” he said. “We’re well organised and well prepared for him. “I think that will enable him to do even more, so he won’t feel like he’s starting from a base, but starting from a fair way along the road and I think that will be really good for him. On his time as diocesan administrator, Fr Lowcock said the past three years was “a real privilege”. “I’ve been able to do some things which I could have never been able to do if I was living at Mount Isa,” he said. “And to motivate some people especially on the Year of Mercy, I had a real passion for that. 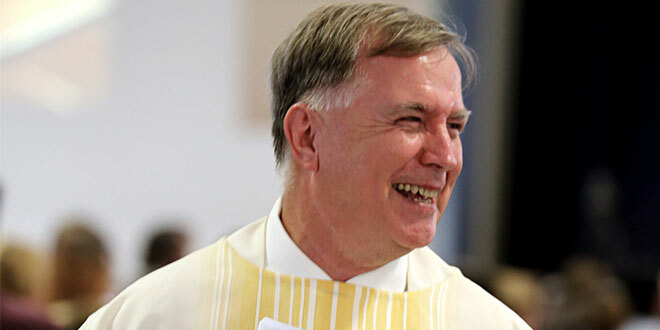 Fr Lowcock will now continue his 24-year ministry in Mount Isa but not before taking up the bishop’s suggestion for a holiday. He will head to Leuven, Belgium, for a conference on Catholic school identity and then spend two weeks in Northern Ireland catching up with priests he met while on long-service leave 10 years ago. Fr Lowcock expects to hear from Bishop Harris when he returns and, while happy to offer some advice, had confidence in the bishop’s ability to lead Townsville without him. “He’ll be right,” he said.